This is a small photo-log of Dussehra festival. 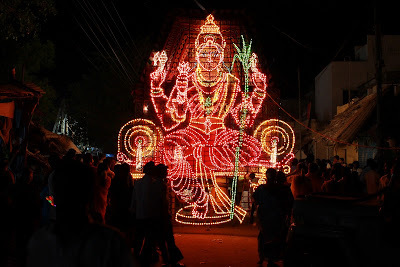 This one was shot at a stage show in Ganesha Temple, Koramangala, Bangalore during Dussehra. A small video clip from the show. The video shakes a bit. Shots from stalls set up at "The Forum mall, Bangalore" during Dussehra. Few shots taken at my native -Tirunelveli.